Why investors should keep a close eye on organic sales growth this year. Kimberly-Clark (NYSE:KMB) shareholders trailed the market last year even though the consumer products giant doubled its annual net income and raised its dividend at a market-thumping 5.4% pace. Wall Street mostly looked past that good news to focus on a metric that's far more important for the long-term health of its business and is heading in the wrong direction: organic sales growth. The owner of global blockbuster brands including Kleenex, Huggies, and Kotex, saw its organic expansion rate slow to a 2% pace last year from a 5% spike in the prior year. Kimberly-Clark's U.S. business ticked up by just 1%, but the bigger contributor to the slowdown was the fact that developing markets dove to a 4% pace from 10% in the prior year. Executives blamed a "challenging economic and competitive environment" for the slump. The economic portion of that explanation has shown up in the results of many of Kimberly-Clark's rivals. Unilever, for example, cited the weakest global GDP expansion in seven years as a key reason why its organic growth pace fell to 3.7% last year from 4.1% in the prior year . 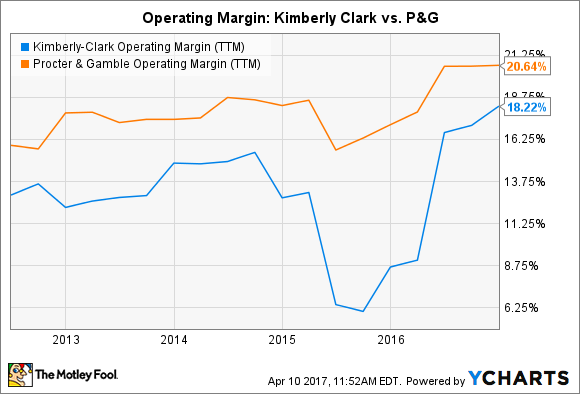 Meanwhile, rising competitive threats from Unilever and others forced Kimberly-Clark to rely more heavily on price cuts. This was especially true in the U.S. market, where increased promotions lowered sales by 2 full percentage points. On the bright side, the company managed a few big financial wins that protected overall returns for investors. Executives sliced a record $435 million out of its cost infrastructure that, in addition to $70 million of savings from its restructuring initiative, boosted profitability. Similarly, Kimberly-Clark made progress at gaining efficiency -- just not as much as it might seem at first glance. Sure, operating cash flow spiked 40% higher to $3.2 billion. Yet one-time benefits were behind most of that improvement, and so management is expecting cash flow to tick lower in 2017 from what they called "over-delivery" last year. CEO Thomas Falk and his executive team are projecting organic sales growth of 2% in 2017, a pace that would mark no improvement over last year's sluggish result. If that comes to pass, it would also put the company behind rival Procter & Gamble for the first time in years. P&G, which competes against Kimberly-Clark's Huggies brand with the Pampers franchise, recently raised its fiscal 2017 organic growth outlook to 2.5% from 1% in the prior year. The good news is that Kimberly-Clark sees operating profit potentially doubling its 2% organic growth pace thanks to aggressive plans for additional cost cuts. Success there, plus continued improvements in efficiency metrics like return on invested capital, should mean that the company has plenty of cash available to invest in growing the business while also boosting capital returns to shareholders through stock repurchases and a healthy dividend. It's unlikely that the stock will begin beating the market again until management can show progress at returning to a stronger organic growth pace that not only demonstrates market share gains but also includes a mix of both volume and pricing increases.